A university's research quality and output play a key role in the assessment so academics have a compelling incentive to make a mark. NUS is now ranked 22nd in the world according to the Times rankings, up from 40 in 2011, while NTU has leapt from 169 to 52. Overall, the number of papers that have been retracted due to academic malpractice in Singapore still ranks modestly internationally. There have been only about 60 retractions involving misconduct or duplicated findings here out of 14,000 international cases in the database of Retraction Watch, a website that tracks such cases, since 2007. Singapore has produced 11,845 research publications since 2007, according to SCImago Journal Rank, a public portal run by the University of Granada. You can't have a system that is perfect; those of us who do science have to adhere to an implicit understanding (of the) honesty and transparency that is expected of us... When cases (of research fraud) emerge, the damage is multi-fold - it affects the reputation of the individual and his institution, and may undermine public trust in science, especially if the research is publicly funded. PROFESSOR CHONG SIOW ANN, vice-chairman of the medical board (research) at the Institute of Mental Health. But that could be just the tip of the iceberg, said observers like Professor Chong Siow Ann, vice-chairman of the medical board (research) at the Institute of Mental Health. "A large number of cases may be undetected, but it's difficult to arrive at an actual figure," said Prof Chong, adding that this is in line with international trends. In one of the largest cases of scientific fraud in Singapore, it came to light earlier this month that former Agency for Science, Technology and Research (A*Star) scientist Sabeera Bonala had admitted to falsifying data in her research and doctoral thesis. 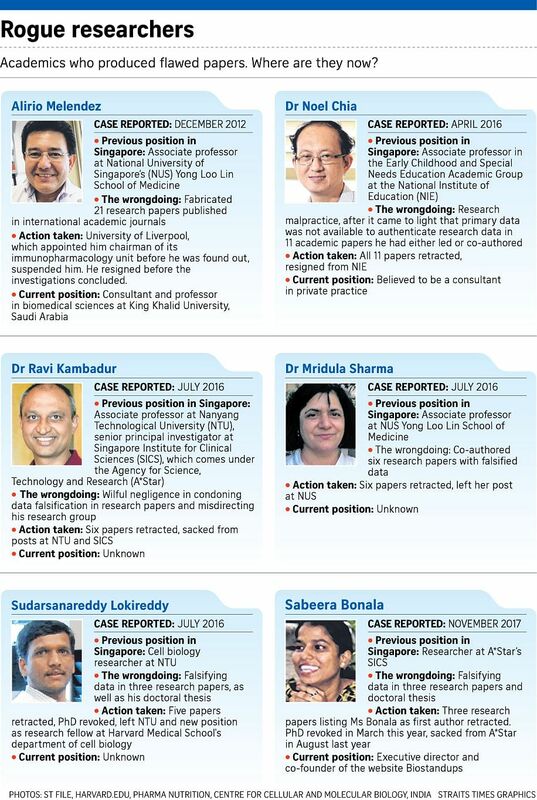 Four researchers were disciplined for falsifying data in six scientific papers, which were partially based on research funded by A*Star and the National Research Foundation Singapore. Two of the four, including Ms Bonala, had their PhDs revoked, and all either quit or were sacked from their positions at top research institutions here, including A*Star and NTU. But many could still be willing to play the high-stakes game, given that one can be rewarded handsomely for producing cutting-edge research that gets published in top journals. A scientist who has worked at both NTU and NUS said that research has become a key performance indicator that is tied to a professor's remuneration and performance bonus. "The consequences (of fraud) can be very, very harsh, and can destroy your career, if not your life. But if you give people such huge rewards (for groundbreaking research), they may think that the reward is worth the risk," said the scientist, who declined to be named. This is exacerbated by the fact that time and money may be required to verify data for scientific experiments, but it may not always be practical to do so for all projects, such as those that stretch over a decade, said an NUS senior scientist, who also asked to remain anonymous. Some journals have replication policies, which means that they will publish only papers that provide clear documentation of data used in the analysis so that other researchers can reproduce the experiment. But only a small number have such a policy, said NUS economics lecturer Kelvin Seah. An NUS spokesman said that "rankings do not inform the university's policies or research directions", and that research performance is evaluated on factors beyond just research output and quality, such as teaching quality. But like all research-intensive universities, NUS still expects its faculty to "carry out cutting-edge research and have it published in leading journals". Last year, A*Star, NTU, NUS and the Singapore University of Technology and Design adopted a unified set of standards for academic publications to enhance research integrity. In addition to reporting suspicious practices, researchers must also maintain accurate and detailed records of procedures and results. NTU has also just launched a data repository system where researchers can deposit, archive and share their final research data. Singapore's guidelines for research ethics are "fairly rigorous" overall, said Prof Chong. "But you can't have a system that is perfect; those of us who do science have to adhere to an implicit understanding (of the) honesty and transparency that is expected of us. "When cases (of research fraud) emerge, the damage is multi-fold - it affects the reputation of the individual and his institution, and may undermine public trust in science, especially if the research is publicly funded." Correction note: The graphic in this article has been updated to accurately reflect the instances of fraudulent reports. We are sorry for the errors.